It's no secret that disrespect can cause significant damage to a relationship. Hurtful words, disrespectful behavior and tense interactions are not easy to deal with on a regular basis. If you are coping with communicating, living with or dating a disrespectful man, learning how to deal with the behavior can help alleviate the stress of the situation. Through creative strategies to educate and learn from each other to discontinue disrespect, it is possible to have a happy and healthy relationship that thrives on mutual respect. Communicate your feelings when dealing with a disrespectful man. Investigate the cause of disrespectful behavior by questioning his reasoning for his words and actions. At times, a man may use language or put-downs as a form of playful teasing to gain your affection, according to marriage and relationship coach Jack Ito in the article "An Interview with Dr. Jack Ito about Disrespectful Men." The behavior may not be meant to intentionally hurt you. Pay attention to the intent of his behavior, says Ito. If a man is trying to control you by putting you down, criticizing you and your accomplishments or hoping to inflict pain with disrespectful words, don't let it slide, confront him right away. Seek out a counselor or objective third party to voice your concerns with a disrespectful man. A mediator may be able to offer constructive advice to help both of you set boundaries for behavior and discontinue any actions that are damaging to the emotional well-being of the couple, according to psychologist and coach Dana Gionta in the PsychCentral article "10 Ways to Build and Preserve Better Boundaries." Be assertive when a man is disrespectful to you. Stand up for yourself and show him that you will not allow him to make snide remarks, disrespectful gestures or violate your rights and feelings, suggests Meg Selig in a Psychology Today article titled "The Assertiveness Habit." Phrases such as "I'm not comfortable with that behavior" and "“I don’t appreciate it when you speak to me that way" assertively communicate your expectations. Set boundaries at the onset of disrespectful behavior, suggests Gionta. Make a list of what behaviors you will and will not tolerate and identify what words, tone of voice or actions make you uncomfortable. Stay calm when communicating your concerns and objections to his disrespectful behavior, recommends licensed psychologist Dr. Marie Hartwell-Walker, in the PsychCentral article "Signs You Are Verbally Abused: Part II." Avoid raising your voice to match his tone and instead, communicate that you are sorry he feels the way he does, but that you disagree and won't condone the disrespect. Take a deep breath and slowly breathe in and out to make yourself comfortable when disrespectful behavior is occurring, recommends psychologist Marcia Reynolds in the Psychology Today article "How to Deal With Annoying People." By managing your own personal health, it may be easier to control your reactions. Pick your battles by first thoroughly thinking through how much the disrespect affects you, recommends Reynolds. 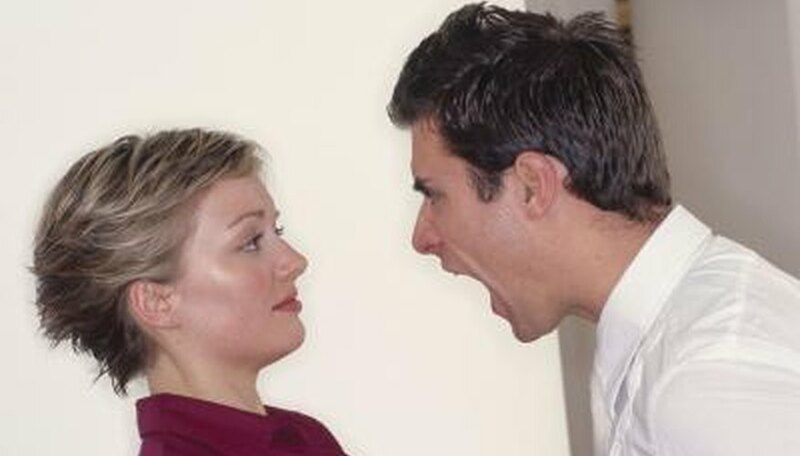 Don't allow a disrespectful man to get under your skin, forcing you to lash out and react in the same manner. Thinking long and hard about how your reaction may affect your own peace of mind. Recognize that you cannot change the behaviors and actions of others who are disrespectful, says Hartwell-Walker. Avoid trying to change someone who does not see the need to change himself. Recommend positive resources for him, such as therapy, if he shares that he is willing to make changes to avoid disrespectful behavior. Model respectful behavior to deter a man from exhibiting disrespectful behavior toward you. Approach discussions about respect when your relationship is going well or when your partner or friend is in a good mood to avoid escalating the conflict and engaging in a heated argument when he is in a bad mood already. Philpott, Shannon. "How to Deal With a Disrespectful Man." Dating Tips - Match.com, https://datingtips.match.com/deal-disrespectful-man-8681070.html. Accessed 23 April 2019.